Slice (film, 2018). A 2018 American horror comedy film with "R" rating by A24. Directed by Austin Vesely. Official Trailer. Slice is a 2018 American horror comedy film directed by Austin Vesely. 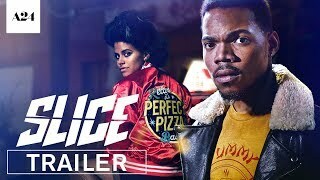 Slice | Official Trailer HD | A24. Perfect Pizza Place deliveryman Sean Hammerschmidt has his throat slit while making a delivery at the Ghost Town area, where the town's 40,000 ghost citizens reside. Kingfisher Chronicle reporter Sadie Sheridan attends Mayor Tracy's press conference regarding Sean's murder. Mayor Tracy is interrupted by shouting from Debbie, a local activist and member of the group Justice 40,000, which seeks to demolish the Halcyon Square on which Perfect Pizza is located. Group leader Vera Marcus later leads a protest outside of Perfect Pizza. Detective Steve Marsh and Detective Bradley investigate Sean's murder and discover evidence that Sean was running drugs for dealer Big Cheese. Determined to solve Sean's murder,Astrid, Sean's ex-girlfriend asks Perfect Pizza owner Jack for her old job back. Jack sends out Astrid along with other Perfect Pizza employees Thomas "Scooter" Martinez, Heather, and Joe, the latter of whom is a ghost. Sadie's research into the murder case leads her to a previous string of murders when the Perfect Pizza Place used to be Yummy Yummy Chinese Cuisine. The prime suspect in those murders was deliveryman Dax Lycander, a werewolf who disappeared, but was recently seen riding his moped around Kingfisher. Astrid shirks her job duties to confront Big Cheese over Sean's murder. Astrid puts a knife to Big Cheese's throat, but flees when the police arrive. Detective Marsh and Detective Bradley take Big Cheese in for questioning, who implies that Dax Lycander is back. Meanwhile, Scooter is killed while making a delivery, and Dax is spotted at the scene of the crime. Vera and Debbie visit Mayor Tracy to demand he tear down the Perfect Pizza Base to prevent vengeful ghosts from killing again. It is revealed that Justice 40,000 and Mayor Tracy are actually in a joint conspiracy to build public support for the site's demolition in order to resell the property. Principal photography began on August 20, 2016, in Chicago. 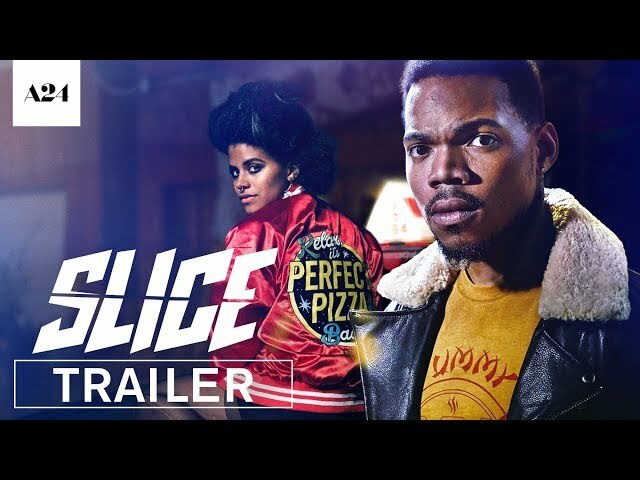 The film Slice was scheduled to be released by A24 on September 10, 2018 (United States). Slice got average rating from critics. The audience dislikes the film either.